Despite strength in jobs from manufacturing to medicine, retail is one of just two sectors that have lost jobs over the last few years. Since January 2017, retail has lost more than 140,000 jobs; the sector added to those losses in March 2019, according to Labor Department data. "Retail is a sector where automation has been particularly present," said PGIM's Nathan Sheets. "U.S. consumers have manifest over many years that they want low prices, even if that means less help from workers on the floor." Though many American industries have ramped up hiring in recent years amid a strong economy and easier regulations under President Donald Trump, one sector in particular has lagged the rest: retail. 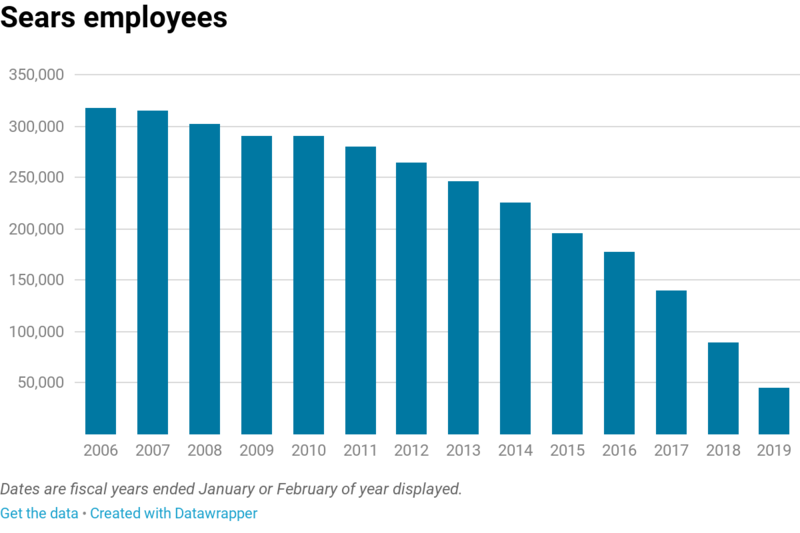 Since January 2017, retail has lost more than 140,000 jobs; the sector added to that in March 2019 with a loss of more than 11,000, according to Labor Department data. The sector is one of just two industries that have lost jobs over the last few years, according to data tracked by CNBC. For example, an aging baby boomer population has fueled employment in the health-care industry, while the post-crisis business sector has supported the addition of tens of thousands of jobs per month. The government's Friday report on the employment situation showed the health care sector alone added 61,000 jobs in March, while the business industry tacked on another 37,000. Despite strength in jobs from manufacturing to medicine, retail is one of just two sectors that have lost jobs over the last few years. Since January 2017, retail has lost more than 140,000 jobs; the sector added to those losses in March 2019 with a loss of more than 11,000, according to Labor Department data. The lukewarm performance in the retail sector have come despite a broader economic groundswell, with Trump's corporate tax cuts giving businesses a balance sheet boost, goosing GDP growth above the rate many economists feel is sustainable. 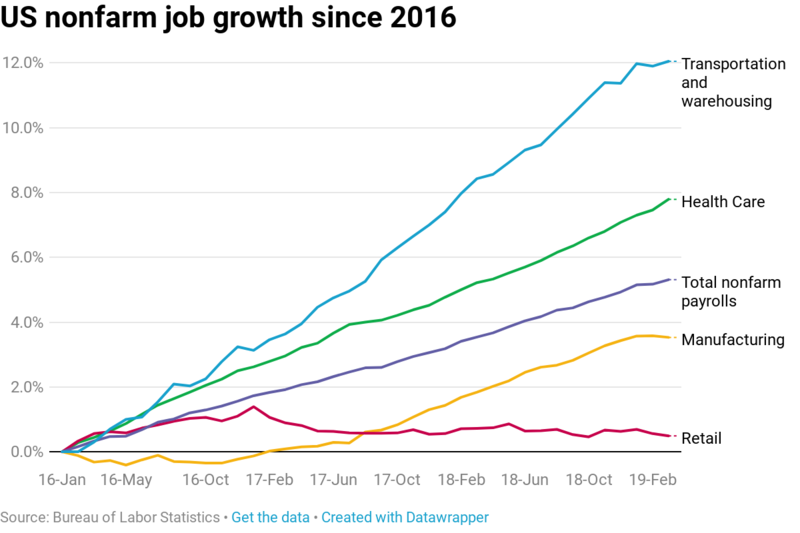 The utilities sector, the only other to have seen a net decline in jobs since 2016, employs less than 1 million people. Retail employs more than 15 million. Theories on the employment softness range from analyst to analyst, most agree that the downtick in the number of people working at big-box retail locations has to do with the rise of e-commerce and technology. "Broadly speaking, retail is a sector where automation has been particularly present. Self-checkouts are now common. If you're not sure about a price, you scan the bar code rather than asking a worker," Nathan Sheets, chief economist at PGIM Fixed Income. As an example the thriving shift toward automation at retailers nationwide, Walmart announced earlier this year that it is expanding its "Scan & Go" technology to an additional 100 locations across the U.S. For consumer staples like groceries that customers still don't feel comfortable purchasing online, Kroger's new "Scan, Bag, Go" platform will allow shoppers to scan their items themselves and allow the chain to cut cashiers at 400 locations. Gap, Victoria's Secret, J.C. Penney, Tesla and Abercrombie & Fitch have all announced that they'll be closing locations in 2019; 4,810 store closures had been announced by retailers by March 2019, according to Coresight Research. The push toward automation checkouts comes as major retailers and supermarkets come under pressure to generate even more profit out of a razor-thin margin business while offering customers a unique shopping experience. "As a related point, the ongoing shift in retail from bricks and mortar to online very much reinforces this trend. For online sales, you largely eliminate customer-facing employment," Sheets added. "U.S. consumers have manifest over many years that they want low prices, even if that means less help from workers on the floor." Perhaps emblematic of the struggles of some retailers to keep up in the modern era, the October bankruptcy filing of Sears Holdings represented for many economists a key moment in the shift toward a leaner business model. Others, like National Retail Federation chief economist Jack Kleinhenz suggested that the government data may not suggest a decline in retail business, but rather a shift in the types of people they employ. "You could now have a major retailer that owns a warehousing and distribution center, and products never go through a store," Kleinhenz said. "There has been improvement in productivity and the use of technology. I caution us to be unnerved by these numbers at this point in time." "The retail industry is actually in sync with the economy and is growing at a pace that is appropriate, but we have to broaden our scope" of how we measure it, he added. Instead of employees lining up at brick-and-mortar store locations, the rise of e-commerce is driving demand for transportation and warehousing staff. A current driver shortage beleaguers the trucking industry thanks to a combination of low compensation, burdensome schedules and conditions of the job. But amid a new generation of consumers accustomed to smartphone shopping and two-day shipping, retail demand for storage square footage is soaring. Some savvy investors, such as Blackstone's Jonathan Gray, have actually poured money into the warehousing business in an effort to preempt the broader trend and capitalize off the scaling need for space. Gray told CNBC in July that the firm had purchased more than 550 million square feet of warehousing since 2010. "As you think about investing, you're trying to think about sort of where the puck's going to, what's happening. We came to a simple view that online sales were going to grow," Gray said from the Delivering Alpha Conference in New York in 2018. "As a result, we've seen this pickup in demand for warehouse space, which traditionally was a pretty boring business." "In an environment where it's hard to invest, finding things you have high conviction in, where you think there's going to be growth – that's a pretty good strategy," he added.